HD fine in DVD recorder but smokes when connected via IDE cables to PC? Hi, I have a DVD HD recorder that i use to transfer vhs videos to the HD to my PC. Today, i plugged it in using IDE cables to my PC and smoke started coming from the top of the HD. I plugged it back in to my DVD recorder and now the DVD recorder wont start. Is there any way that i can get data off this HD please? I doubt it, sounds as if you have burnt out the electronics at least. DVD HD recorder sometimes relies on some software on a hidden partition of the drive to run. When swapping to a larger drive in a recorder the usual method is to image or the old drive to the new one. If you have a spare drive it may be worth fitting to the recorder and see if it starts. Make and model of recorder? Thank you. It is a LITE ON 5045. In the past i have tried starting it with other HDs and you are right- it requires specific software to run. However, it starts up fine with no HD in but obviously the meny shows no data. So the HD is probably beyone repair? 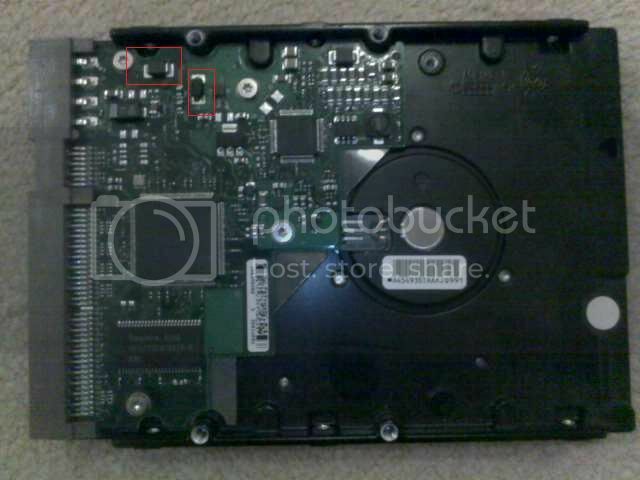 Afraid the only way your likely to get info off the old drive is to buy one exactly the same and swap the electronics over and that may not work if the platters heads or motor id damaged. Good that you should mention about getting a replica HD as i had two Liteons exactly the same so i do have one exactly the same. Please can i ask how i would go about swapping the electronics? Is it complicated? Make sure you have everything off your working drive worth making an image of it just in case. It should just be a matter of unscrewing the board and carefully disconnecting the ribbon cables. Swap reconnect cables and screws. I suggest you do not attach to your PC but instead put in a working caddy and connect via USB. Hard to tell but I think the bits that you ringed are the voltage regulators. Thank you so much!!! I need to get one of those caddies. Ebay/Amazon? Hi, Unfortunately (and stupidly) I got a bit eager when my new HD caddy and plugged in the faulty HD before swapping over the boards just to 'see if it works' (I said in my head), the result was a bang from the rectangular power unit that is connected to the plug and now the caddy doesn't work. One new caddy coming next week. Let's hope im not so stupid again. Sigh! I swapped the board from the non-working HD with the identical working HD and used a new caddy.......and the same happened- there was a flashing sound from the power box connected to the lead of the caddy and a smell of burning. Are there no other options left available to me now?